Political themes emerge in wallpaper's recently history. First, Andy Warhol's most famous wallpaper depicted Chairman Mao with a purple face, simply repeated. Like his cow wallpaper, the pattern challenged traditional notions of wall coverings with strong color and bold composition. It also created a strange discord between the poppy colors and the unlikeable political figure. 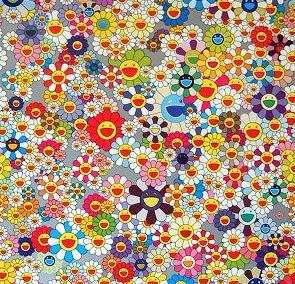 Then we have the Japanese artist Takashi Murakami, known for his bright colors and fanciful, absurd renderings. 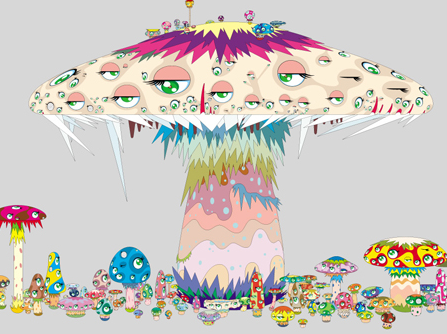 With mushroom, eyeballs, and happy flower characters, Murakami evokes political themes associated with the atomic bombs that dropped on his home country. Like Warhol, he creates an intriguing (even disturbing) effect by matching such serious political themes with such an optimistic, energetic color palate. 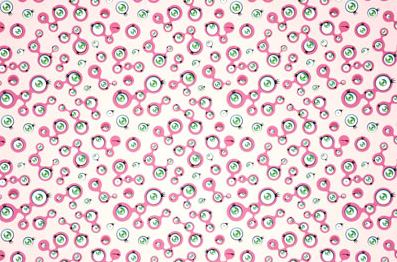 Nick Peters picks up where Murakami and Warhol left off. 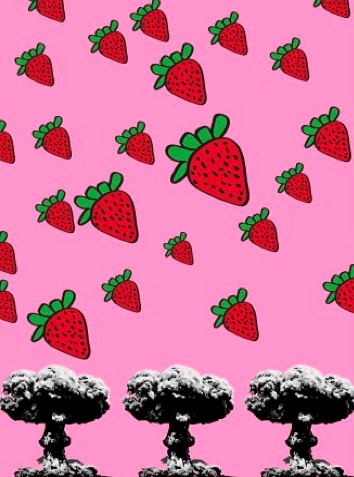 Several of his images mix World War II bomb imagery with innocent, even childish, fruit renderings. He also uses wallpaper to investigate the current political situation in Russia. After meeting Putin for the first time, George W. Bush said, "I looked the man in the eye. I was able to get a sense of his soul." Peters patterned those eyes, adding hammers and sickles. olitical wallpapers certainly do not appeal to mainstream taste, but they do provide an interesting outlet for activism. They also serve as yet another example of the thin line between wallpaper and fine art.